Do you get confused at the different rug production methods? 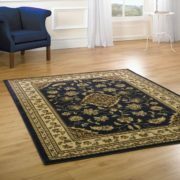 This article should help you understand the difference between various types of hand made and machine made rugs. Woven rugs have one thing in common a warp and a weft (the backing), the warp is the strings that run the length of the rug and the weft is the stings that the run across the width of the rug holding the rug together while providing an anchorage for the pile or rug surface. In Europe and America rugs are mainly produced by machine, by far the most popular method of production is on the Wilton loom. Computers control the modern Wilton looms giving the manufacturer infinite design and production planning options at greater speed. The main advantage of modern Wilton looms is they will produce rugs faster by using a face-to-face weaving method. To explain simply, in face-to-face production the loom produces a rug sandwich made up of two warps and wefts (backing) and the decorative surface or pile of the rug as a single sandwich filling. Once woven the rug sandwich is split to produce two rugs that are a mirror image each other. Wilton rugs are usually woven a pile surface of polypropylene or wool although there are few produced in viscose or jute. 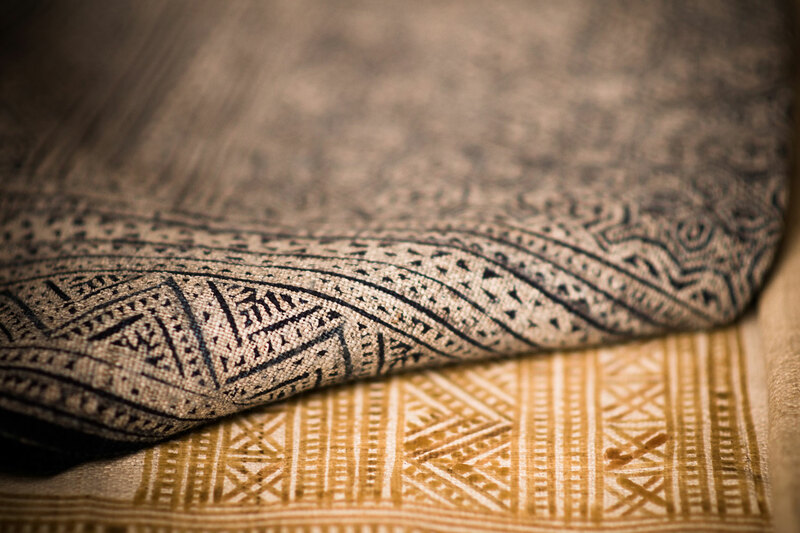 Polypropylene is favoured by manufactures because it is inexpensive, easy to produce, stain resistant and is virtually problem free during weaving. Polypropylene fibres come in two main varieties BCF (Bulk Continuous Filament) and Heat Set, whilst both should have the same wear properties of the two Heat Set Polypropylene is processed to have a softer wool like touch. When using wool in a Wilton rug manufactures tend to favour New Zealand wool. Though New Zealand wool an expensive option it is softer to touch and is better for dying both pastel and vibrant colours. 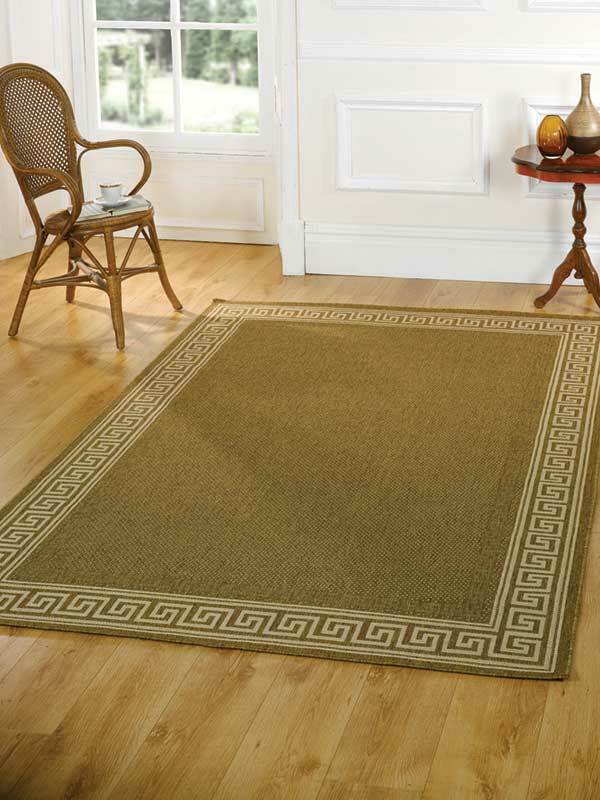 It does add to the overall cost of the rug the overall finish is considerably superior. Hand made rugs are come in both traditional and modern designs and in the main produced in the Middle East, India and China where labour is more affordable. Hand tufting is by far the quickest method of producing a rug by hand and is commonly used for modern and contemporary styles including many popular shaggy rugs. The method doesn’t use a conventional warp and weft; instead a hand held gun that shoots yarn into the primary backing of the rug to create various designs and textures. Once the design is complete the rug will have secondary jute backing attached by adhesive. Finally the rug will then be hand carved to give an added dimension. The main production centres for hand-tufted rugs are India and China. 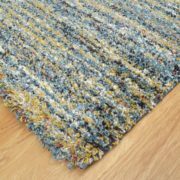 Although hand tufted rugs can be produced with literally any fibre because of the local resources we primarily see production of wool and viscose rugs from India and production of brighter acrylic and viscose fibres from China. Are mainly produced in India and other parts of Asia. This method manufacture relies on a loom that is powered by the hands and feet of the operator. The rugs are usually produced from wool. Is a flat woven rug that looks like a heavy blanket usually woven in wool on either a handloom or power loom. While Ancient Britons were experiencing the Bronze Age, a method of hand knotted rug manufacture was developed in Persia. This ancient production method involved each tuft being knotted by hand to the cotton warp of the rug. Today hand knotted rugs use the same basic technique of manufacturer. The two main methods of knotting are the Senneh knot (Persian knot) and the Ghiordes knot (Turkish knot). The Senneh knot is asymmetrical which is less likely not leaving gaps in the pile surface, as it is less bulky than the Turkish Ghiordes knot. Hand knotted rugs are the most time taking method of manufacture and therefore the most expensive. They are normally produced from wool, silk and have a cotton warp and weft. The fibres are hand dyed with vegetable dyes and the designs and styles are normally indigenous to the region where they were produced. Hand knotted rugs are made in Middle East and Asia. Many variations on hand knotted rugs are produced in textures such as shaggy pile rugs. Shaggy leather rugs have long and short stands of leather hooked into the cotton warp and weft. 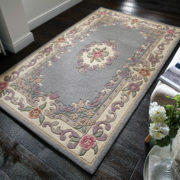 Viscose (Art Silk) shaggy rugs are also often produced as knotted rug to give the rug better tuft anchorage.